Thermo Cube: Thermostatically Controlled Outlet. $19.95. "My cube shorted out after 3 months use. I contacted Gun Dog Supply who put me in touch with the manufacturer." My cube shorted out after 3 months use. I contacted Gun Dog Supply who put me in touch with the manufacturer. They agreed to promptly replace the unit. They did advise that the cube is not water proof and needs to be put in a zip lock bag to avoid shorting out. This might be good advice to put in the promotion of this item. However I am still extremely pleased with the service. 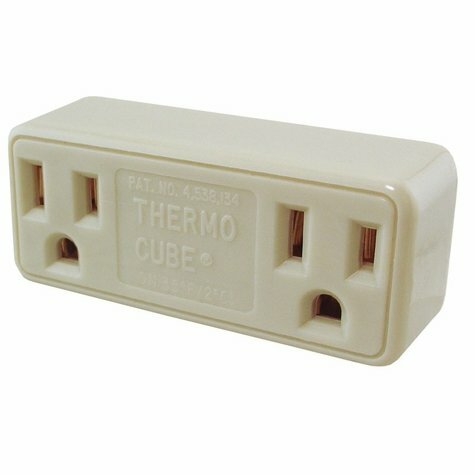 Warning: The Thermo Cube must be protected from exposure to the elements with a Weather-Proof Outlet box, or by being plugged into an otherwise protected outlet. A GFCI protected outlet is strongly recommended. Thermo Cube is a device which, when plugged into a standard 120V AC electrical outlet, will automatically turn power on and off to any device plugged into it. This Thermo Cube will automatically turn on power when air temperature reaches approximately 35 degrees F and will turn off the power when temperature exceeds approximately 45 degrees F.